If you stroll to the festival on foot, you won’t have to deal with parking and you’ll burn a few extra calories. So, you won’t feel guilty for eating that bag of mini-donuts. Minoru Park is located along Granville Avenue which has a dedicated bicycle lane for nearly its entire length. Safely and securely store your bicycle at the festival using our FREE Wheel Watch–it’s like a coat check, but for bikes! Take the Canada Line and disembark at the Richmond-Brighouse station. Cross the street, walk through Richmond Centre, and the festival is a short walk away. In total, the distance from Skytrain to the Park is a mere 800m! Minoru Park is surrounded by bus routes. Take the 410 for a drop off right outside the festival gates. Ride the 407 and have a lovely 5 minute scenic walk until you get to the festival. Or you can take any bus which drops you off at the Richmond Centre stop (402, 403, 404, C94) and walk to the festival in 5 minutes. If you are planning on driving please try to carpool as parking at the festival will be limited. 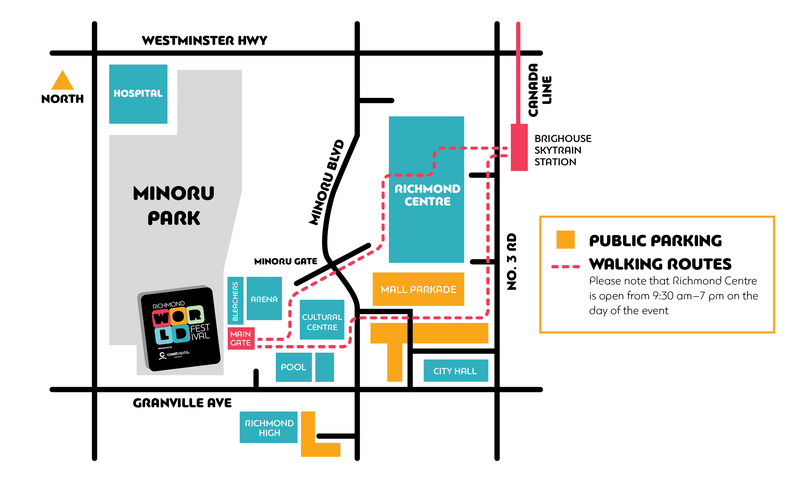 There is no parking at Minoru Complex, but you can park in the south parkade at Richmond Centre, Richmond City Hall, and along the adjacent neighborhood streets. We have accessible parking located behind Minoru Pool (enter off of Granville Street).